SCP SCIENCE acquired the CONOSTAN® brand in 2007, adding its line of elements-in-oil standards to the SCP SCIENCE group of products. The CONOSTAN® Division of SCP SCIENCE is the world’s leading manufacturer and marketer of Elements in Oil standards and related spectroscopy products. 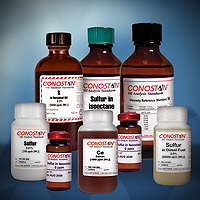 The CONOSTAN® leading industry position is derived from superior product chemistry, manufacturing technology, and blending techniques. CONOSTAN® products are used extensively in the calibration and operation of analytical instruments for the analysis of elements in oil and other organic fluids. CONOSTAN® is the only source of metallo-organic standards in the history of the National Institute of Standards & Technology (NIST). Click here to see a history of CONOSTAN® and NIST. The variety of products afford convenience as reference and routine analytical materials for AA, ICP, DCP, XRF, Rotrode, and other analytical techniques.